The defense, offense and special teams all contributed touchdowns in the Owls’ 37-13 win over the Buffalo Bulls Saturday. Revenge was on the minds of the football team’s members Saturday. And the Owls got it in a big way. After a shocking last-second loss to Buffalo last season, the Owls came out and dominated the Bulls in a 37-13 victory at Lincoln Financial Field. 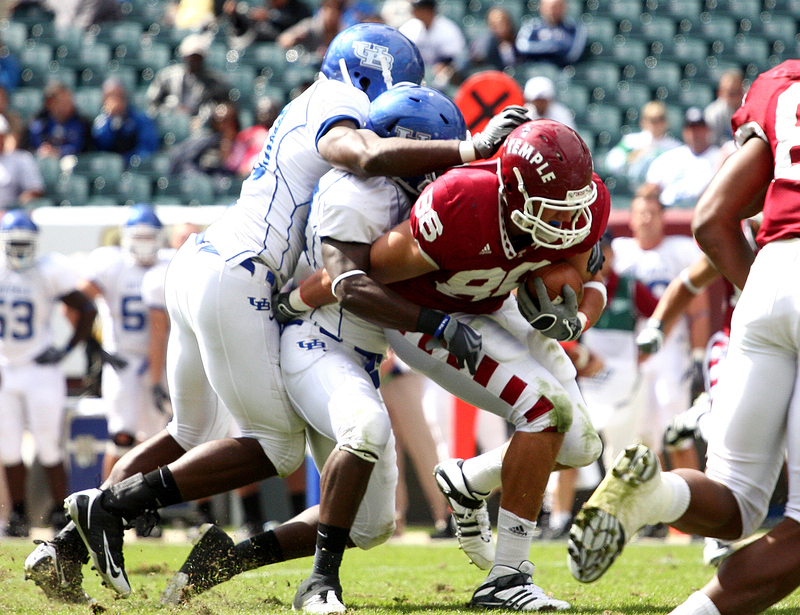 Temple entered the matchup with Buffalo looking for its first win of the 2009 season, while also trying to exact revenge from last season’s last-second Hail Mary touchdown pass that gave the Bulls a 30-28 win. It was the defense that came into the rematch with a chip on its shoulders, and the unit did not disappoint, as it bothered sophomore quarterback Zach Maynard and the Bulls offense all afternoon. After allowing 27 points and 31 points to Villanova and Penn State, respectively, the defense held Buffalo to only 13 points and forced five turnovers. Sophomore defensive end Morris Blueford Jr. recorded a sack and his first career fumble recovery. Juniors Marquise Liverpool and Elijah Joseph and seniors Andre Neblett and Dominique Harris all intercepted passes from Maynard. The interceptions by Liverpool and Neblett were the first of their careers. Joseph returned his interception 95 yards and put the Owls ahead for good, 20-6. His interception run broke the school record of 92 yards that was set by Rich Lee in 1971 against Delaware. While the defense harassed the Bulls’ offense, the Temple running game wreaked havoc on the Bulls’ defense. The three-headed monster of freshman Bernard Pierce, senior Lamar McPherson and sophomore Kee-ayre Griffin torched the Bulls for 198 yards rushing on 40 carries. Pierce led the way with 20 carries for 116 yards and scored his first career touchdown on an 18-yard scamper that accounted for the Owls’ final points of the afternoon. Pierce said that using three backs allows him to be at his best at the end of games. McPherson and Griffin combined for 77 yards on 17 carries. Golden also got help from his most dangerous weapon – sophomore wide receiver James Nixon. After Buffalo jumped out to a 6-3 lead, Nixon answered right back with a 92-yard kickoff return down the sideline that put the Owls back on top and ahead for good. Freshman kicker Brandon McManus, who took over the job during the game against Villanova, made field goals from 35 yards and 22 yards apiece. And despite only completing six passes, redshirt junior quarterback Vaughn Charlton opened the second half with a 71-yard drive that ended with a 5-yard touchdown pass to sophomore tight end Evan Rodriguez for his first career score. What Golden wants right now is a turnover-free football team. After turning the ball over five times in the opener, the Owls have only turned the ball over twice in their past two contests. Players used last year’s FCS loss as a learning experience. The Owls scored 27 straight points in their 37-10 win against East Carolina on Saturday at Lincoln Financial Field to win the American Athletic Conference’s East Division and claim a spot in the conference title game. 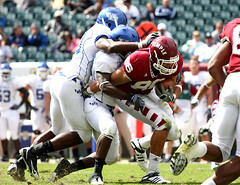 Ventell Bryant caught his first touchdown in 680 days to lift Temple over Navy 24-17 on Saturday.